This is a laugh out loud play inspired by Sharon's own experiences growing up in rural Roscommon. 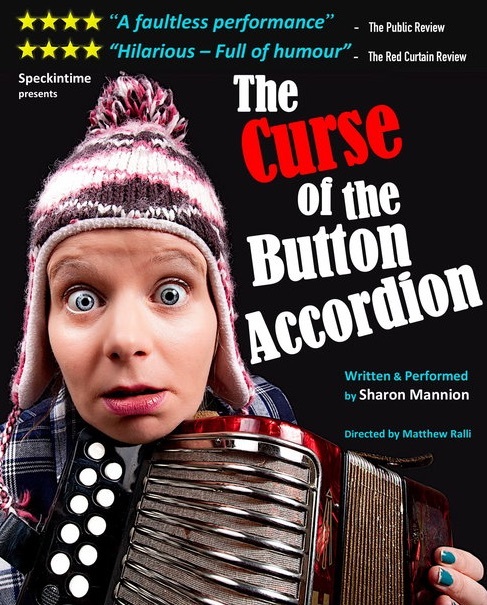 In this heart warming coming-of-age tale Sharon introduces us to the weird and wonderful characters that have influenced her life, not least of all Frank, her button accordion. After eighteen months of development 'The Curse' has thrilled audiences in theatres across the country including: Roscommon Arts Centre; Mermaid Arts Centre - Bray; Riverbank Arts Centre - Newbridge; The New Theatre - Dublin; dlr Mill Theatre - Dundrum; The Dock - Carrick-on-Shannon; St John’s Theatre - Listowel; Friars’ Gate Theatre - Killmallock; Trinity Arts Centre, Castlerea; Visual: Bernard Shaw Theatre - Carlow, Ballygar Arts Centre, Co Galway; Nenagh Arts Centre. Director: Matthew Ralli, Lighting Design: Paul Doran, Sound Consultant: Carl Kennedy, Producer: Melissa Nolan, Touring technicians: Shannon Cowan & Darragh Brennan. Sharon is an actor, comedian and improvisor from Co. Roscommon. She is best known for her comedy TV work: 'Bridget and Eamon' (RTE), 'Trojan Donkey' (Channel 4/RTE), Callans Kicks (RTE), Moone Boy (Sky 1) and Damo & Ivor (RTE). She won Best Stand Up award at the inaugural Fr. Ted Festival and has been a finalist in both the UK & Ireland Funny Women and Bulmers Comedy Festival stand up competitions. Sharon Mannion was awarded a bursary from Roscommon County Council to develop her initial thirty minute script into a full-length play. The premiere performance in her home town was proudly supported by Roscommon Arts Centre.